If you missed reading about the termination of Coach Frank Cruz, the following is the official release. No further information is available. USC baseball head coach Frank Cruz was first suspended and then terminated for knowingly violating NCAA Countable Athletically-Related Activities limitations within his program, Trojan athletic director Pat Haden announced. USC baseball head coach Frank Cruz has been terminated for knowingly violating NCAA Countable Athletically-Related Activities limitations within his program, Trojan athletic director Pat Haden announced today (Feb. 13). Those CARA rules restrict the number of hours studentathletes can spend in activities directed by or supervised by the coaching staff. In addition, the University has self-imposed a reduction in the number of practice session hours for the USC baseball team this season and next year. “Adhering to all NCAA rules is paramount for each one of our coaches, student-athletes and staff members,” said Haden. “Those who knowingly break NCAA rules are subject to termination.” USC has alerted the NCAA and Pac-12 of the infraction and the University-imposed actions. Still in pre league play our young baseball team with 2 seniors in the starting line up, evened their record to (2-2) in a closely played game at home against Loyola. It was a well played game that saw good pitching and timely hitting. With the game tied in the eight, freshman right fielder Vahn Bozoian drove in Greg Zebrack to give the Trojan 2-1 victory. As they have demonstrated so far this season the pitching looked promising. Freshman Brent Wheatley had a strong first outing of the season, allowing four hits and striking out four in 5.0 innings. Nigel Nootbaar threw a scoreless eighth to pick up the win. Kyle Davis closed out the game with a scoreless ninth, picking up his first save of the season. Former Baltimore Orioles star Don Buford has been elected President of our Baseball Alumni Association. Don brings to the position a wealth of management and baseball experience. Don’s dedication to every challenge he has faced is impressive and we look forward to his leadership. In addition to being President of TBAA Don is the Director of MLB’s Urban Youth Academy which grew out of an initiative of MLB to revive interest in Baseball in inner cities (RBI Reviving Baseball in Inner Cities). The Urban Youth Academy, located in Compton serves thousands of youngsters of both genders and any talent level. Over 100 former players spanning multiple decades returned to Troy to celebrate the past and enjoy a little fun on the field for the annual alumni game. The current Trojan team welcomed back all former players but were not too kind on the field, winning the annual game 13-5. The day also featured an “old timers” game, with older alumni getting out on the diamond. Many Trojans were savvy enough not to try their luck on the field but did hop in the batting cage for a few swings of the bat. An effort to have a long ball contest was cut short because of time. Golf lovers how about this. If you are thinking about maybe attending the Masters Golf Tournament in Augusta this April, check this out. You can save a ton of money and experience a great number of amenities that you might not otherwise. Alex Sherrod (played right field the past 4 years and his dad Charlie have a company (Seven Star Golf) that will provide tickets, hotel reservations, transportation to and from Atlanta to Augusta. The can accommodate any group size. Dave Rankin’s book on Rod Dedeaux is now in print. The title is Rod Dedeaux: Master of the Diamond. The book should hold special interest for players, coaches, and fans, but also for the general reader who is curious to know how a legendary man conducted the business of teaching young men about baseball and about life. Former Trojans players and fans can purchase or learn more about this book by clicking on the following web site www.coacheschoice.com. and then at the top of the page click on the word “baseball”. Sammy Sosa — Commenting in a recent interview on the MLB Hall of Fame votes, thinks he and fellow steroid tainted star Mark McGwire belong in the Hall of Fame. Stan Musial — Musial, one of my favorites as a small boy passes on. Musial a Hall of Famer played his entire career for the St. Louis Cardinals and had a lifetime batting average of .331 and won 7 batting titles. UCLA — Enters the season ranked second in the Country with every starting pitcher and an All-American reliever back from a team that finished 48-16. Setting their sights on Omaha, Coach John Savage said, “We’re still building, still creating that identity”. Darin Erstad — Well known former Angel Darin Erstad now the head coach for Nebraska brought his Cornhuskers west for some pre season play and warmer weather. With a 35-23 record last year they were eager to test the strength of the west coast teams. They left after losing all 4 games of the trip. 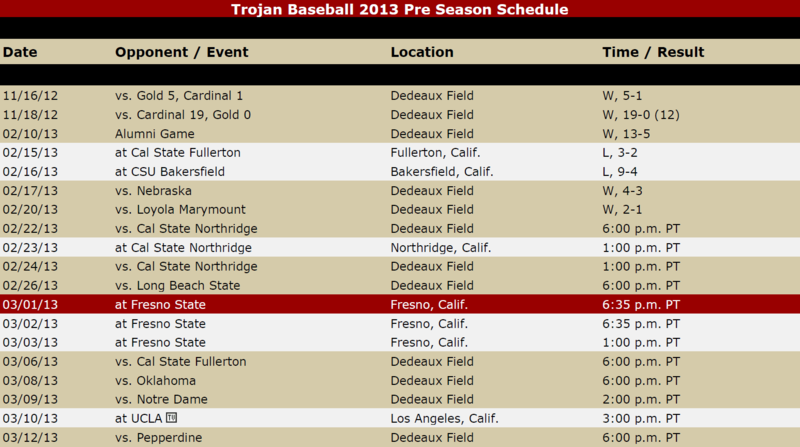 Losing twice to CSF and once to Bakersfield and USC.